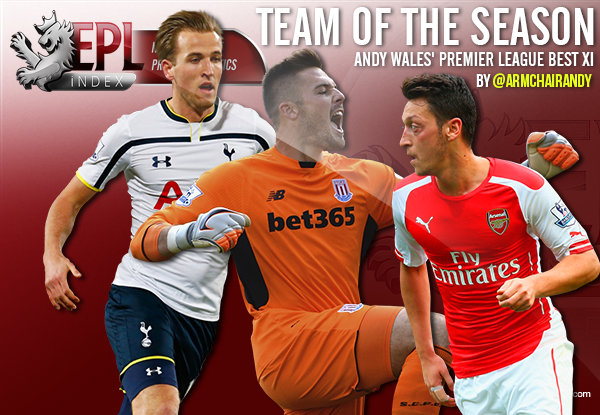 The PFA Premier League team of the season for 2015/16 has just been announced and it was largely as expected, with perhaps one or two surprises in there. These things are often a cause for debate and can be skewed by the team you support, but I like to think of myself as fair, so here’s my team of the season. It really is a shame that injury cut his season short and will rob him of being part of England’s Euro 2016 squad because he has been outstanding this season. Kasper Schmeichel has been impressive for Leicester, but Butland, for me, has given the best individual goalkeeping performances in the Premier League this season and has a big future ahead of him. He’s played his part in a tight defence and contributed at the other end of the pitch with some excellent set piece delivery. The Austria captain has had a very good season since arriving on a free transfer from Schalke 04. He’s taken his game to a new level this year and clearly revels playing under Mauricio Pochettino. A rock at the heart of the Spurs defence, leading and marshalling them in an excellent campaign, he’s also weighing in with some important goals as well. Individually and on paper, not one of the better centre-backs in the league, but has led his team superbly. It’s been an unbelievable season for Leicester and Morgan has played his part and put his body on the line. The Arsenal defence has again had a difficult year, but Bellerin has still stood out in what has been an excellent season for him, whether attacking or defending, where he’s progressed up a level and found an impressive consistency level. The German playmaker often doesn’t get the credit he deserves and his off the ball work goes largely unnoticed. Ultimately, it’s been another disappointing year for Arsenal, but for the most part, Özil has exuded class with his creativity this season despite not having consistent finishers ahead of him. In his first full season in the Premier League, Alli has been outstanding and Spurs look to have got themselves a star. With his running, technical ability, tenacity, vision and goals, the young England midfielder could light up the Euros like he has White Hart Lane. Mahrez and Vardy have got the goals, but Kante has been just as influential to Leicester’s dream season. At £5.5m he is another piece of astute business by the Foxes and his tackling and interceptions rank with Europe’s elite. He’s been an integral part of a midfield that’s shielded Leicester’s tight defence and also helped supply their productive attack. At times, Mahrez has been sensational, scoring an incredible 16 goals, some of them stunning. His skill and guile have gained a growing number of admirers and will probably be the subject of expensive transfer speculation this summer. The Algerian is yet another product of Leicester’s smart scouting and deserves all the accolades he’s received this season. The season started slowly for Kane and many wondered if maybe he was just a one season wonder, but once he got going, he’s barely stopped. He’s not the quickest or the most skilful, but he knows where to be at the right time and proved his composure as a high quality finisher, leading an excellent Spurs campaign from the front. Not everyone’s cup of tea and not blessed with great technical ability, but late-bloomer Vardy has proved to be a thorn in the side of many a defender this season. He’s utilised his speed, tenacity and alertness to be Leicester’s man on the spot many crucial times and scored a few screamers in there as well; his international call up is one he’s earned. Difficult to pick anyone else for Manager, with only Pochettino running him anywhere near close. Ranieri has masterminded a season that even the most ardent Leicester fan could not have dreamed of. Not only that, he’s handled himself impeccably in the process, showing what a class act he is and I suspect he’s found a place in the heart of many a football fan this year. Categories: Arsenal (NN), EPL Index Featured Article, EPL Index Player Profiles, Leicester City (N), Stoke City (NN), and Tottenham Hotspur (NN).' 'Tags: Alderweireld, Alli, Bellerin, Butland, Claudio Ranieri, Fuchs, Kane, Kante, Mahrez, morgan, Ozil, and Vardy.